"DO YOU USE THE FULL POWER OF SPIRITUALITY IN YOUR EVERYDAY LIFE?" Here’s a quick quiz about the relationship between your spiritual and your everyday life. Answer these 5 questions. 1. Being in harmony with all areas of your life is important for you to stay firmly on your Spiritual Path? 2. Do you feel that something is really wrong when you can't reach the same goals that people on a lower spiritual level achieve with ease? 3. It's essential for a spiritual person, to reach one’s life-goals in a really spiritual way. 4. Do you know how to use your spiritual life harmony to create a rich, abundant and happy material reality for yourself and those dear to you? 5. Do you want to learn to use your spiritual options instead of imperfect ways of achievement that are not in harmony with your true Self? If your answer is YES to any (or all) of those questions, the good news is: You will profit enormously from 15-year experience that I will share with you in this article. Whether you are a Spiritual professional, a life-long enthusiast, or just a beginner on Spiritual Path, knowledge from this article will literally revolutionize your material reality. Read all of it. Every piece of it is packed with information that could change your life. As you read it you will start to understand how you can use your spiritual options to achieve material reality that is in harmony with your spiritual path. Why so many spiritual people live their lives as if it is a test of spiritual endurance? As if they were testing if they can stay on Spiritual Path despite all the hardships of everyday life. Don’t live such life. Read thoroughly this whole article to its end and it will give you all you need to make your spirituality the most valuable asset that you have. How you can, in simple, step-by-step set of concrete actions, achieve each and every goal you have. Reach them successfully every time and in the perfect harmony with deepest parts of your Spiritual Path. Why spiritual people waste most of their energy in struggle with the unconscious parts of their being, instead of taking simple actions that will achieve their goals. How to recognize ways of achieving your goals that are in harmony with your Spiritual Path -in the areas where you were forcing and pressuring yourself as most spiritual people do when dealing with material reality. This article will show you how to use your spiritual options and live everyday life of abundance and prosperity instead. What are the "alert signals" from your unconsciousness that try to alert you that you are not getting closer to your goal. As a Spiritual Being you know everything you need to know to reach your goals, but you don’t understand clear signals that your unconsciousness sends you. Once you master this unbelievably simple technique, achieving your desired material reality is "peace of cake"-straightforward. In this article you will also have the exclusive opportunity to take a peak in content of my "SPIRITUAL OPTION: Use the Full Power of Spirituality in Your Everyday Life" e-workshop. "I have created my company from scratch using Spiritual Option. In just six months I have succeeded in achieving it just the way that I've imagined it at the beginning of my work with SPIRITUAL OPTION (and surpassed it in many ways). Click here to read other SPIRITUAL OPTION reviews. "Something You Always Knew Deep Inside"
Why is it so critical to use your spiritual options in your everyday life? Most of us believe that enduring unsuccessful and unpleasant material reality in your everyday life is a natural part of Spiritual Path. Being in harmony with yourself and with the universe is much more important than having a lot of money, expensive car or beautiful house. "I have accomplished THE MOST DEMANDING BUSSINESS PROJECT with SPIRITUAL OPTION in just three months! Imagine this: you know exactly what your goal is. You know exact steps you must take to accomplish it. You know what could go wrong and exactly how to deal with it if it does. You know with 110% certainty that you will succeed. 92% of all spiritual people feel that there is a conflict between Spiritual Path and their everyday (material) life. This is why you need to learn how to reach your life-goals in the Spiritual way and to really use your spiritual options. Using such options guarantee that you'll achieve things that you want, in a way that is in harmony with the deepest parts of your being. "If you are a spiritual person, one thing you need to learn as soon as possible is how to transplant the harmony of your spiritual path to your everyday life. Or as Filip says to use your spiritual options. If you are the same as 95% of spiritual people the only thing you need to create such a life is ability to really use your spiritual options. 17 different people from all around the world started their own businesses with SPIRITUAL OPTION in last 4 years. Not one of them failed. And these practitioners are just ordinary people, not experienced businessmen. This fact is even more impressive when you consider that 95% of all new companies go out of business in the first two years. 11 other practitioners worked on improvement of their existing businesses and all of them at least doubled their profits in the first three months of practicing SPIRITUAL OPTION!!!! At least 14 different people, whose goal for SPIRITUAL OPTION practice was to get an ideal job, have now achieved their goals (summer 2006.). "The best thing I've gained with the Spiritual Option is the deep understanding of the miracle of creation, and acceptance of the full responsibility for it, as well as for my whole life. Before creating the Spiritual Option system I’ve been using different spiritual and self-development systems considered to be the best in the world today. From NLP to different kinds of Energy therapies and communication based systems. I had a good fortune of working side by side with my father Zivorad Mihajlovic Slavinski. He is commonly regarded as one of the pioneers and most important figures in the field of Spiritual Technology in South-Eastern Europe and the World. I owe a big part of what I know about spirituality to Zivorad’s techniques (he was my mentor for first 10 years). And I was privileged to benefit from the growing body of spiritual knowledge he’s gathered with his 50+ year experience in the field. While working with those techniques, I was able to see first-hand the dramatic impact they can make in one’s life. I would use some spiritual techniques on client’s reality, and in following weeks we would see dramatic changes in his or her life. From finding a perfect life partner or a new job, to starting one’s own business or dramatic improvement in relationship with dear ones. It was amazing. In following years I combined these techniques with different spiritual and self-development systems from around the world, and I got even better results. During these years I specialized in the work with clients on the Spiritual Path that wanted to make major changes in their material reality. But the real breakthrough came in 2002, with SPIRITUAL OPTION (at that time known as PRECISION). SPIRITUAL OPTION was a real success. It was amazingly simple (practitioners could practice it by themselves), it was universal, and it was incredibly effective. IT REALLY WORKED!!! "I appreciate Filip´s Spiritual Option because this system of life-goal achievement techniques is a very fast and highly efficient method to achieve your goals. Now, stay with me and listen closely. You are reading the chronicle of events that lead me to the discovery of little-known principles that I've used to help hundreds of spiritual people achieve their material goals. Finding an ideal life partner, getting the house of your dreams, publishing your book, getting the money for that trip to India, starting or improving your own business. Down to such trivial stuff as earning more money or covering the debts on your credit cards. You name it. Whatever your current life-goal is, some SPIRITUAL OPTION practitioners have already achieved it with these techniques. I worked on hundreds of my clients' goals, and I've amassed a large amount of specialized knowledge in my 15 years as a reality creation coach for spiritual people. This gives me the privilege of knowing exactly what works and what doesn't work for achieving life goals on the Spiritual Path. The good news is that you are about to reap the benefits of my experience allowing you consciously create your reality with the ease of a magician. Since then, I have coached my workshops in more than 12 different countries around the world, including United States, Italy, Holland, Turkey, Russia and almost all countries of Balkans, the part of Europe that I live in. Participants from 17 different countries attended my workshops. Some of them traveled around the half of our planet to come to Belgrade and Serbia, and paid 1000$ to work with me on their life-goals. On workshops on my first USA tour (Chapel Hill (NC), Memphis (TN), Louisville (KY)) some of participants came all the way from Singapore or Saudi Arabia. During these years I had various offers for business cooperation, including the offer from one of the leading online businessman (he represent some of the most famous people in spirituality and success coaching field). To make a long story short, he urged me to distill my teachings into an e-workshop, to make SPIRITUAL OPTION available to people around the world by Internet. That e-workshop, of course, is "SPIRITUAL OPTION: Use the Full Power of Spirituality in Your Everyday Life" - and the good news is that it has just recently been released. Now you, too, can discover these powerful concepts that will let you transplant harmony from your Spiritual Path to your everyday life. At first I was skeptical, as I am "brick and mortar" person, not an online person. I was used to working face to face with clients or in live workshops. So, for the past several months, while my website was in its construction phase, my publisher allowed me to test e-workshop with people that contacted me by “word of the mouth” advertising (by good references from my clients). "Wouldn’t it be nice if someone gave you a simple formula that would show you, step-by-step, how to achieve any goal you want? From finding your ideal partner or perfect job, to selling your first movie script. SPIRITUAL OPTION e-workshop is such formula"
To prove to you how effective SPIRITUAL OPTION techniques are, I created "Quick Goals" CHEAT SHEET. 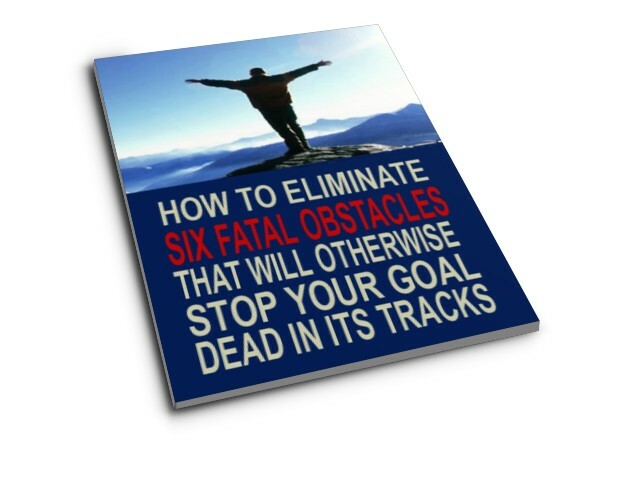 Its title is: "HOW TO EASILY ELIMINATE SIX FATAL OBSTACLES WHICH WILL OTHERWISE STOP THE ACHIEVEMENT OF YOUR GOAL DEAD IN ITS TRACKS." This Cheat Sheet contains the essential ideas of my new S.O. QUICK GOALS system, and the tips and techniques which will allow you to achieve your goals with ease and effectiveness you always dreamed about. Using these practical tips with just an average effort (not committed one :) your understanding and ability to achieve goals will skyrocket in just a few days. Just enter your e-mail address below, and you will have "SIX FATAL OBSTACLES" Cheat Sheet in your inbox in just a few minutes. If you are like 99% of spiritual people, I know what you are thinking. You think that this is just another "positive thinking" system like dozens you’ve seen and practiced before. YOU COULDN’T BE MORE WRONG!!! It's the only system for achieving your life-goals that guarantees achievement in a way that will be in complete harmony with your Spiritual Path. Most systems of this kind stress setting your goals, motivation, planning how will you achieve it, etc. But if you are spiritual person all those things are secondary. It doesn’t matter how clever your plan for achieving your goal is, if it’s not in harmony with your Spiritual Path. And the opposite is also true. When you use your spiritual options everything else fits easily into its place. The goals that you achieve using your spiritual options will be in real harmony with your Spiritual Path and will give you real satisfaction. SPIRITUAL OPTION really works. You have probably studied and practiced dozens of positive thinking and similar success systems (quite vigorously for some of them I guess:-). And you probably think that SPIRITUAL OPTION is something like that. Prepare for the surprise of your life. Unlike most such systems SPIRITUAL OPTION really works!!! It works exactly and precisely. It works in such a way that you won’t need to practice it for months or years to see specific results. You will notice crucial changes in yourself from the first exercises and first use of these techniques. You will know right from the start that you are getting rid of your own barriers and that the system is really working. SPIRITUAL OPTION system is universal. It is absolutely effective for any goal you have. Starting or improving your own business, getting and leading a big project in a company that you work for, organizing your spiritual group or publishing your own book. It doesn’t matter. Whatever your life goal is, learning how to use your spiritual options will guarantee that you’ll achieve it in the best possible way. SPIRITUAL OPTION works perfectly even for "impossible" goals. When you start using SPIRITUAL OPTION techniques, first things that fly out of a window are your limiting beliefs and internal barriers. Goals that may really be impossible when you behave in your normal manner will be easily within your reach once you master using spiritual options. Things that once were impossible seem so easy when you know exactly how to accomplish them. As if they are ripe and ready - waiting for you to pick them up. This e-workshop features an easy-to-follow, step-by-step approach for reaching your life goals -- from start to finish. With SPIRITUAL OPTION e-workshop you will have an exact blueprint of how to achieve any goal - from the first idea about it to the perfect final accomplishment. With this revolutionary blueprint anyone can achieve any goal. It’s not like other "goal achievement" or "success" books or workshops, that just offer a kitchen sink full of tips, techniques and general guidelines. SPIRITUAL OPTION gives a specific, hands-on approach for creating the life you always wanted. You can start creating such a life at once. Think about the pressure that you put on yourself when you try to do something you are not in harmony with. When you force yourself to take "positive" actions. Now, you can forget about it! When you start using your spiritual options you will work on all your goals effortlessly. You will be naturally motivated to do all necessary actions, and you will do them all in perfect harmony. SPIRITUAL OPTION is based on UNIVERSAL LAWS of goal achievement. If you study successful spiritual people you will see that they all have very much in common. Years of work with such people on their goals allowed me to extract those common characteristics in universal laws of goal achievement. Mastering and using these laws in your everyday life will let you achieve even most demanding of your goals with enviable ease. Even if you don’t know what your perfect life goal is, or if you chose the "wrong" goal for yourself, this system will give you great results. It will change that "wrong" goal into one that is in harmony with your whole being and your Spiritual Path. SPIRITUAL OPTION is a system that leads you to achievement trough increase of harmony with yourself. Even if you start with the goal that is not right for you, SPIRITUAL OPTION techniques will naturally change it to one that is in deep harmony with your Spiritual Path. More than 35% of people realize in the early stage of the work with SPIRITUAL OPTION that their starting goals aren’t right goals for them but ego-generated remains from their past. Most of them also realize that without SPIRITUAL OPTION they would have spent a big part of their lives struggling to reach those wrong goals and never gained a real sense of accomplishment or satisfaction in those areas. SPIRITUAL OPTION will let you use unlimited potentials of your UNCONSCIOUSNESS to create your desired reality. All the answers that we need for achieving our life goals are available to us, but we ignore them most of the time. In SPIRITUAL OPTION e-workshop you will learn how to precisely access those answers and to use all of your potential for achieving your life goals. The total power of your spiritual being - CONSCIOUS and UNCONSCIOUS will be focused on the things that you really want. This e-workshop also features my proprietary Formula for Exact Measuring of the Optimal Personal State for Work on Your Goals. This is an awesome tool for assessing your personal state for a work on your goals. With this formula you will easily find necessary improvements that you need to make in yourself for reaching your life goals. In this way, instead of heavy burden, your mind will become a spiritual machine that will relentlessly drive you toward creation of your perfect reality. SPIRITUAL OPTION e-workshop is an encapsulation of the material I am teaching in my SPIRITUAL OPTION workshops for which students from all over the world are paying $250 apiece to attend. Now, you can have the same high-octane goal-achievement workshop in electronic form so you can learn and practice at your own pace. The concepts and techniques of SPIRITUAL OPTION are all proven in practice. Hundreds of spiritual people achieved their life goals with almost unbelievable ease (see reviews link to reviews page). The concepts presented in the other systems, on the other hand, are primarily untested and unproven. Most of them sound good, and seem to make logical sense but in truth, they don't work very well. "It is not as I have imagined it before I started practicing the system. Achieving your goal with the use of SPIRITUAL OPTION requires significant amount of work. I childishly believed that the system would do it for me:-). But when I realized this, I knew that I would really make it. SPIRITUAL OPTION e-workshop is a great deal. It’s the exactly the same power-packed material from my SPIRITUAL OPTION workshops that others have paid $250 to attend on a group workshops or even $1000 with individual coaching! It’s the same theory, same materials, and exactly the same exercises from step-one to final achievement of your life-goals! You, on the other hand, can own SPIRITUAL OPTION e-workshop for not even half ($125) or even one-quarter ($62.5) of the cost what my students paid for the same material. You can have SPIRITUAL OPTION e-workshop for the modest price of only $37. That's a savings of $210 off the price. Act now, and you can have your goal achieved in couple of weeks, or few months. "The ability to use one's best options is every athletes dream. If you are also a spiritual person, it is essential to use spiritual options. It is like being in the zone of optimal action. You correctly identify all your options both in offense and defense, and use the right ones. SPIRITUAL OPTION is probably THE most valuable asset I have as a player. I am enormously grateful to Filip for creating this miracle of spiritual success technology. Thank you Filip!" --Lapčevic Ivan, top athlete, 150+ times member of NATIONAL HANDBALL TEAM of Serbia. The bottom line is, for a little more than the price of a good book, you can get your hands on knowledge that will mean the quick achievement of your life goals and the creation of reality you always desired. A life of abundance and prosperity - perfect life partner, rich and steady inflow of spiritual money, house or car that you wanted from your childhood. Any goal you have is a fair game. Filip, to say that you're an UNBELIEVABLE teacher for creating spiritual person’s reality, is an understatement. I would have to say you're the world's best "spiritual success" coach to date. You have definitely revolutionized the techniques for dealing with material goals of spiritual people! The SPIRITUAL OPTION e-workshop is 100% guaranteed to be the most reality-changing spiritual tool you've ever seen -- or your money back. You assume zero risk. My guarantee policy is simple: SPIRITUAL OPTION will work for you right away or it is completely FREE!!! I'm offering you a guarantee that I think you couldn't find anywhere else in the world! Download the SPIRITUAL OPTION e-workshop now, and if in the first 60 days you don't achieve real, concrete boost in achievement of your life goals or if for any other reason you aren't 100% satisfied, just let me know and your credit card won't be charged at all. If in any moment, you aren't convinced that this is THE GREATEST spiritual reality-changing tool you've ever seen, the whole amount will be courteously refunded to you, and you will have the material for free!!! Yes, you've understood it right. After you have installed and licensed it, EVEN IF YOU WILL ASK FOR A REFUND, YOU CAN USE MATERIAL AS YOU LIKE!!! So, if you are not completely satisfied with SPIRITUAL OPTION material, it will be completely free for you. I give this same guarantee to participants of all my workshops. At the end of every workshop I ask every participant if he has got a greater value than the money and time that he invested in SPIRITUAL OPTION. If he (or she) is not sure that he did, I immediately refund complete amount that he has paid for the workshop. 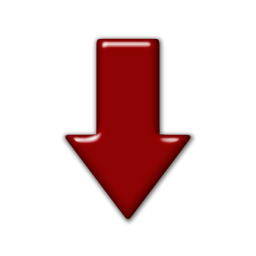 STATISTICAL FACT: In the last four years that SPIRITUAL OPTION workshops are done, not a single person have asked for a refund!!! This guarantee isn't a marketing trick. The SPIRITUAL OPTION e-workshop is the most valuable thing that I have to offer to you and every other person on Spiritual Path. It is the knowledge that took more than 20 years to perfect. This knowledge will let you transfer harmony of your Spiritual Path into your everyday life and finally start using your spiritual options! So, here's the deal: Go ahead and preview the SPIRITUAL OPTION e-workshop in its entirety without risking a single dime. If, for any reason, you're not completely satisfied -- I will be happy to refund every cent of your purchase and you’ll have a whole material for free. I shouldn't have to convince you of the obvious benefits that using your spiritual options would bring you. If you think you can't afford $37, that's exactly why you need this e-workshop. It'll teach you to use this unique spiritual goal achievement method and quickly reap benefits from bringing your spiritual and your everyday life in harmony. When you have that, you can forget about your money problems forever. You simply can't afford not to use your spiritual options. "After mastering Spiritual Option, I am left with a real respect for Filip and his method. It's amazingly simple and quite powerful. I am so impressed with the depth of change that was achieved so quickly. When do you want to have such reality? If I am right, your answer is: "It couldn't be soon enough!" 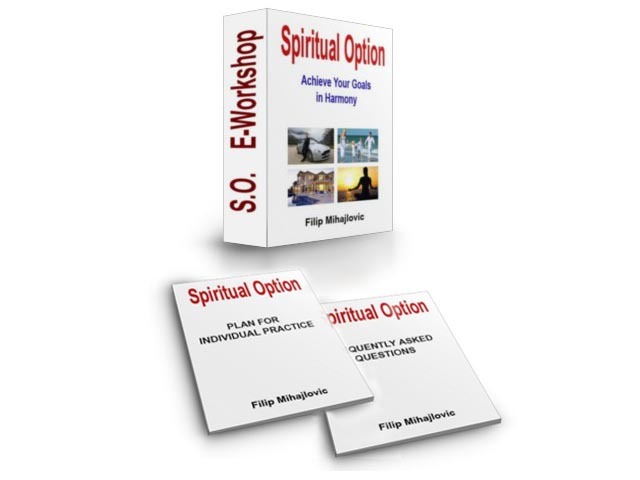 Therefore, I strongly urge you to download SPIRITUAL OPTION e-workshop right now. Clearly, there isn't anything out there that's as comprehensive as this -- at any price. It will change your whole reality to one of spiritual harmony in no time. "When it comes to teaching people how to harmonize their lives Filip Mihajlovic is an absolute genius. But what's truly amazing is his singular skill in simplifying the craft of reaching any goal into a skill that's both learnable and infinitely easy. And please don't confuse SPIRITUAL OPTION e-workshop with other goal-achievement or success-creation books or workshops, because it’s totally different. This is a leading-edge e-course not available anywhere else. SPIRITUAL OPTION is Spiritual Life-Goals Achievement System that will work for you RIGHT AWAY or it is completely FREE!!! I suggest you download your SPIRITUAL OPTION e-workshop right now-- so you can jumpstart your life at once. Attract a flood of abundance and harmony for yourself and those dear to you and start experiencing your Spiritual Path as harmonious as it is supposed to be.